Sawyer County Record is the Hayward area’s community paper. Hawyard Area Chamber of Commerce website serves as a complete source of links and information for the Hayward area. 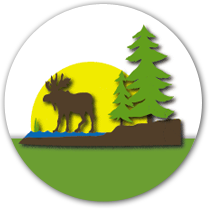 Chippewa Flowage Resort Association maintains the ‘virtual home’ of the Chippewa Flowage. Enjoy our local golf courses while in town. Check out Hayward Golf & Tennis Club and Big Fish Golf Club. The Chequamegon National Forest is an ever-changing forest of northern hardwoods, pines and meadowlands. Hayward Amusement Park has go-karts and mini-golf. Call 715/634-3510. Lac Courte Oreilles Casino is the north woods’ beautiful new home to blackjack, slots, bingo and lounge. Call 800/526-2274 or 715/634-5643. National Freshwater Fishing Hall of Fame features mounts and photos of record fish, plus a 2 story building shaped like a musky. Call 715/634-4440. Raging Rapids is a fun water slide and attraction park. Call 715/634-6952. Chequamegon Area Mountian Bike Association (CAMBA) maintains miles and miles of both on and off-road trails. Sawyer County Historical Museum is our local history museum featuring lumbering memorabilia. Call 715/634-8662. Wilderness Walk is a 35-acre animal farm and recreation park with wild and domestic animals, walking trails and petting zoo. Call 715/634-2893. © 2019 Tiger Musky Resort | All Rights Reserved | Website by CCS, Inc.